Bergen is an old and historic city, dating back from the 9th century. Bergen has always been a centre of commerce and the Hanseatic League were residents in the city for several hundred years. Bergen was the Capital of medieval Norway until the 14th century, but the importance of the city never faded. The famous composer Edvard Grieg was from Bergen, just one of numerous names who make up Bergen’s cultural heritage. Bergen was named European Capital of Culture in 2000. 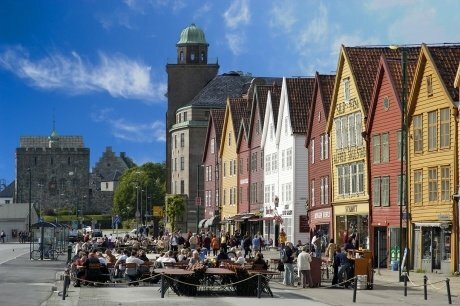 Bergen has given a warm welcome to its visitors for more than 900 years. Bryggen has become a symbol of our cultural heritage and has gained a place on UNESCO's World Heritage List. Today Bergen has 277.000 citizens. The city is an educational centre, with the university attracting thousands of young men and women to the city every year. Bergen is also an important place in the Norwegian tourist industry, and tourists often know the city as the “gateway to the fjords”. The harbour is one of the busiest in northern Europe, and as in the recent 1000 years, commerce is thriving. The famous Bryggen in the town centre. In the background you can see Håkonshallen and Rosenkrantztårnet. The very first buildings in Bergen were alongside this harbour. Bryggen has been the nerve centre of the city for hundreds of years and the silhouette of its ancient gables is perhaps the most familiar image in all of Norway. In 1360 the Hansas - a German guild of merchants - set up one of their import/export offices on Bryggen and dominated trade for the next 400 years. Ulriken is one of seven mountains surrounding the city of Bergen. 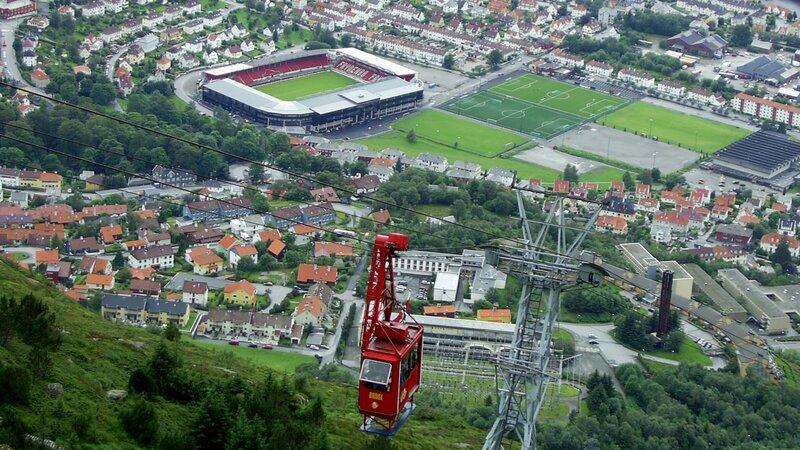 From the top of Ulriken you have a great view towards Brann Stadion and the city. 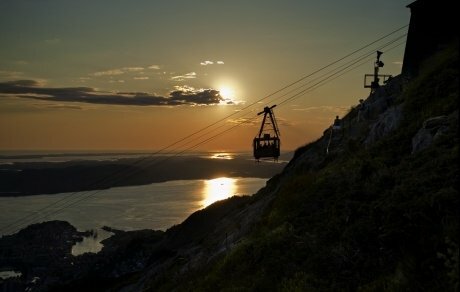 The Ulriken643 Panorama Tour takes you by cable car up into the mountains near the city centre. From the viewing platform you have uninterrupted panoramic views of Bergen and the sea, fjords and mountains that surround the city. You haven’t really been in Bergen until you’ve been up Mount Ulriken! 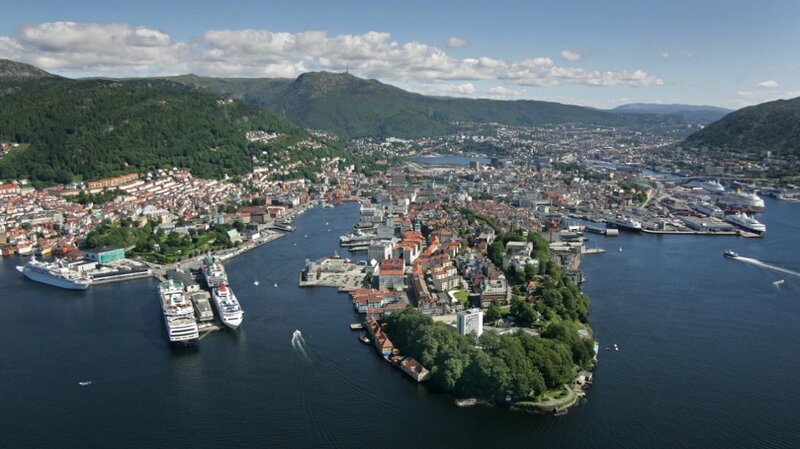 Bergen is situated at the west coast of Norway, surrounded by fjords and mountains. In 2001 Bergen hosted Kutty Sark Tall Ships Race. 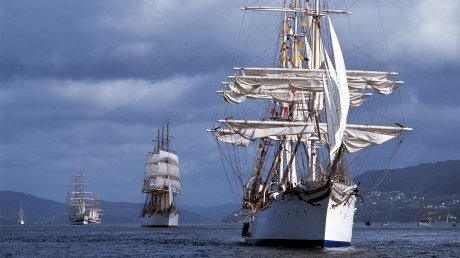 The ship in front is Statsraad Lehmkuhl of Bergen. This flight gives you the ultimate panoramic experience of Ulriken643. You make a running start together with your tandem pilot, take off from the summit of Mount Ulriken and hover in the airstreams above the city. 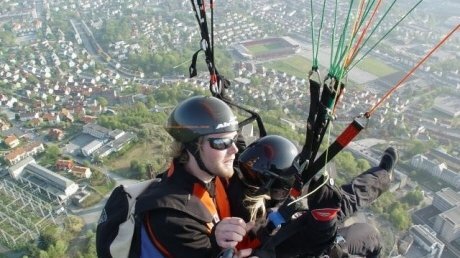 You enjoy a bird’s eye view of Bergen for 10-15 minutes, experience the silence and calm, the sheer joy of soaring like an eagle above the city before landing safely at the landing site beside Brann Stadion.